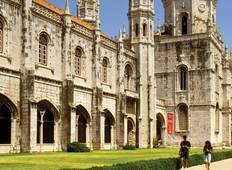 Find the best 2 week tours and trips starting from Lisbon. Choose from 34 tours - we've found the most popular time to visit is in August with the most number of tour departures. "I was disappointed with the drive/guide from Lisbon to Seville. The guide neither..."
"it was the best travel experience I have ever had. the travel accommodation were..."
"We just returned from Lisbon / Northern Spain with Globus. In general we had a very..."